Immediately after pouring intense Sherrynoten flow from my glass. Fresh, red fruits dominate, especially cherries, strawberries and raspberries. A good portion of vanilla / caramel, raisins and orange peel add further accents. The abundance of flavors is enveloped by noticeable wood flavors, old leather and fresh pipe tobacco. The nose is tuned very harmoniously for my feeling. The spicy and leathery aromas can already draw conclusions about a decent age. Very sweet and soft at first, followed by a mild bitterness. Dry, intense Sherrynoten put a first exclamation mark. Dark fruits dominate in the beginning (cherries, plums, preserved raisins, blackberries) with a fine note of honey and caramel sweets. Strong-spicy wood flavors, leather, pipe tobacco, dark chocolate and nuts follow quickly. The alcohol content of 43% is perfectly integrated. 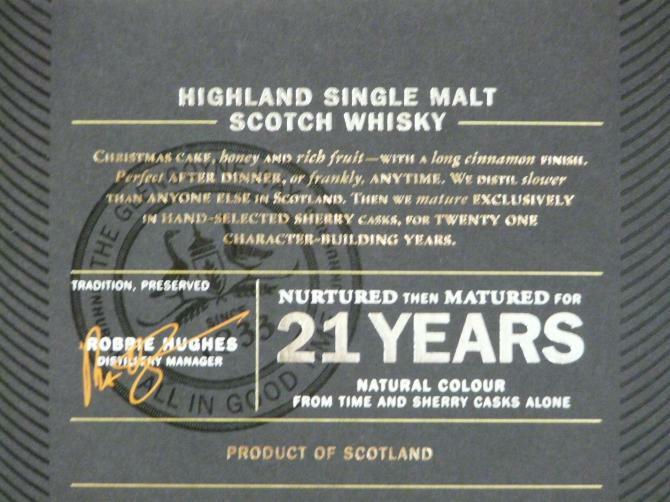 The variety of flavors comes to the fore - with 46% -48% the whisky would certainly be a bit "better / more interesting". 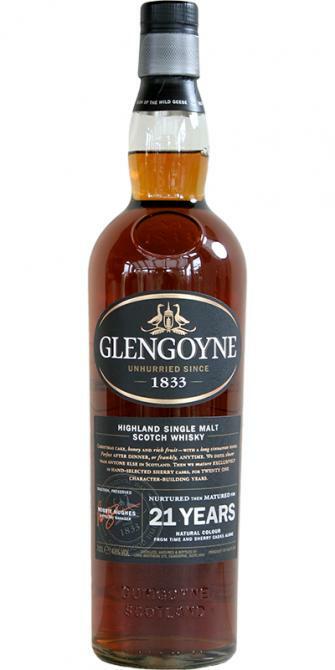 An alcohol content of 48%, for example, the 25-year-old Glengoyne, even if he is priced in a different league. Medium to long. Pleasantly warming and aromatic. The dark fruits say goodbye very fast, so that the spicy flavors quickly take over the tastefulness. Cinnamon, cloves, tobacco, dark chocolate and spicy oak notes follow. A noticeable bitterness and dryness arise. Just let the whisky do the talking..We could spend hour after hour talking about the body, nose, taste, structure, finish and so on but not with this one..i just don’t feel like when i smell this..
Just pour yourself a dram, let it sit and breath for about 30 minutes. No for real...let it sit for this amount of time. Don’t you touch it. Not just yet. Find yourself the most comfortable position possible and just enjoy without a single word...oh man what a dram! Best 95 euro’s ever spent! This is what whisky supposed to be. Oh man this is one hell of a treat. I told you before, let the whisky do the talking but i can't get it out of my head. It's a fact that i just have to do a tasting note for this one. If only it were that it just deserves it, big time! This is really good stuff. Spot on for my pallet. Man this is mature! Just beautiful. There a very refined sherry wood nose. It's smooth, it's creamy, it's mature, it's soft and oily. Ripe red fruits, and something syrupy. Almost maple syrup. Very gentle and refined spices/herbs. The depth in this one is amazing. A hint of Tobacco. Cigar leaves if you ask me. A little vanilla. Tanines complete a very thick bodied, mature nose. A very very convincing Glengoyne experience, i can tell you that! Again it's soft. Perfectly balanced, amazingly full bodied and thick. Like the nose suspects it to be, it feels really syrupy. Well done! Almost sweet spices complement a hint of raspberry, cherries and some dried plumbs. There's a typical dry olorosso note at the and. Definitely wood. And when you keep it in your mouth for like 15-30 seconds dry spices will appear. It gives this one a little bite and all of a sudden there's a small explosion of soft red fruits at the end. Well done Glengoyne!! When swallowing it, there's dry wood, oloroso sherry notes, plumbs and again very gentle spices. This one covers the mouth completely in a (again) syrupy, sticky way and it just doens't want to leave the pallet. Finish length...Does it ever end?? On the whole, this bottling is very successful, although I do not like the dominant harsh and dark wood tones in the aftermath. 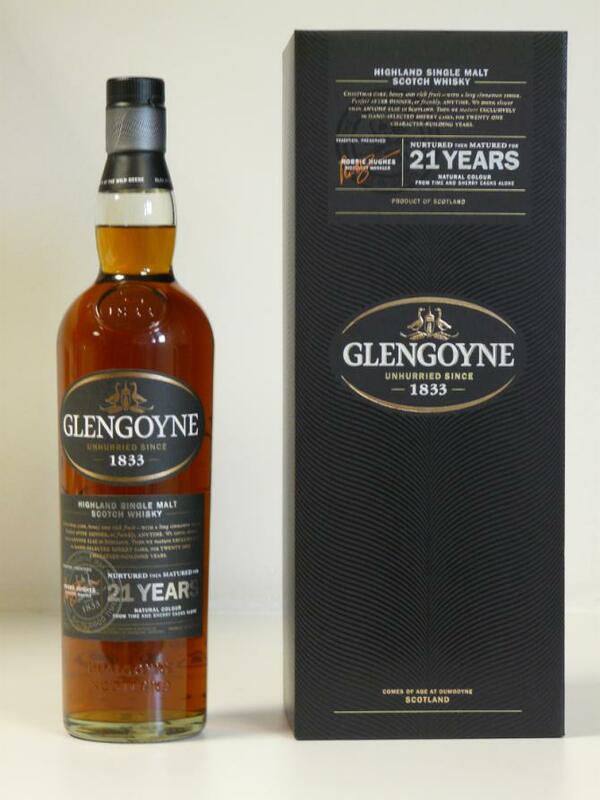 Likewise, I find the Glengoyne 21 with only 43% a little weak on the chest. The nose is auspicious, at the beginning of the first sip the world is still perfectly fine for me. Unfortunately, the sweet and fruity elements do not save themselves in the second part of the taste and the aftertaste. Here dominate the already mentioned bitter and slightly bitter wood flavors. Nevertheless, I do not want to talk bad about this malt and today award "only" 87 points. 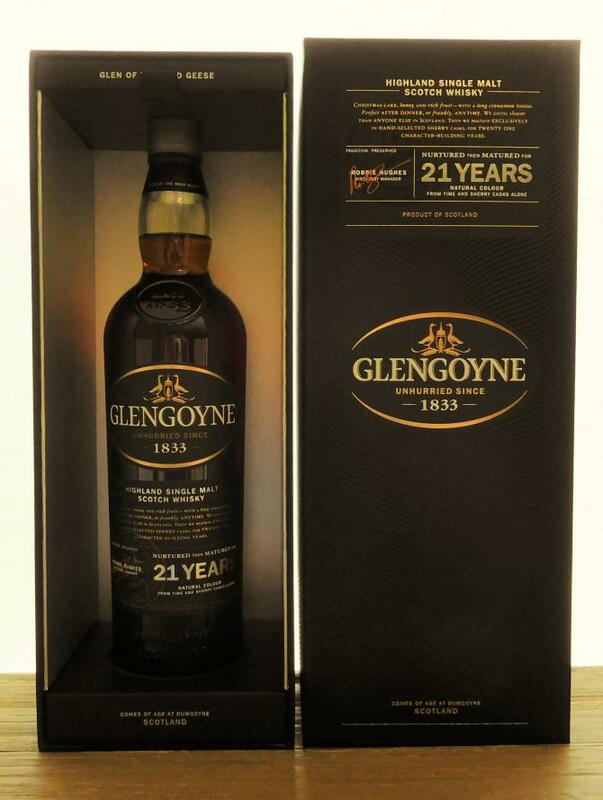 In any case, this Glengoyne gets the next few days a second chance. Intense and strong amber shines in the glass while on the glass wall an oily streak has formed from which a few syrupy legs dissolve and run back into the premium sniffer with relish. Dark red berries and old caramel mix at the beginning of nosing to a fragrant mixture, a pinch of cinnamon falls into creamy milk chocolate. Sour cherries and plums rise, scuffing of orange peel trickles on dark caramel and creamy toffee. A touch of dry leather dissolves from the dark fruit mixture, old tobacco leaves exude their delicate fragrance. Overripe apples and lightly burnt sugar are added, the sweetish aromas are slowly gaining the upper hand. Sugar, caramel, toffee, vanilla and a hint of cinnamon powder are permeated with spicy woody elements and a hint of sulfur. The nose changes slowly and becomes tart and darker, spicy notes of wood and a hint of dark chocolate dominate the nose now. Mild yet full-bodied, the first sip flows through the palate. Dark berries and spicy wood tones play together, the mouth becomes noticeably drier and tart. Sour cherries and plums appear before a subtle sharpness shyly covers the tongue. Somehow, the sharpness can not prevail and spicy, slightly tart wood tones dominate the taste. Dark caramel in combination with dark forest honey shows up, a touch of resin and pine needles flash up briefly. Echoes of furniture polish and dark wood notes end in a creamy mouthfeel. The second sip is initially mild and harsh, but I can hardly perceive fruit flavors now. The dark oak aromas outweigh, here and there dark caramel and a hint of sour cherries. Herb and partly bitter, the dark oak flavors rest on the palate. Again furniture polish comes to my mind, which slowly covers the tongue and leaves a pale and harsh taste on the tongue. The mouthfeel becomes noticeably creamier and tart. Where were the fruit flavors and the sweet elements from the nose and the first sip? At the moment, the dark and tart wood flavors have completely taken over control, now and then sparkle dark chocolate and dark caramel. An indefinable spice note slowly dissolves from the harsh wood tones and makes the aftertaste but not quite so monotonous. At the end of the aftertaste dark coffee aroma rises, creamy, the tart and spicy aromas sound and leave behind a hint of butter and old wood in the lower jaw. Very round, very elegant. Simply good. Heavy, beautiful, dark Sherry scent. Comes around the tongue, filling the mouth soft and full. Very oily. Strong sherry, varnish and leather, dark fruits. Heat develops, only very tender oak. Dark chocolate joins. The medium-long finish is characterized by the slightly stronger oak. A beautiful sherry malt, which belongs neither to the very sweet representatives, nor superimposed superimposed by oak. I certainly did not have it in my glass for the last time. The best I liked the multi-layered nose. Right off the bat, really nice, intense sherry flavors and a certain freshness: rum-raisins, orange peel, caramel and toffee and brown sugar. At the back you will find exotic fruits - especially pineapple but also something that reminds me of very ripe kiwis. First, a clear start with a lot of spicy oak and nice sherry flavors. The dark fruits outweigh the taste: plums, dark berries and sour cherries. With all this much dark chocolate, coffee and espresso. Overall, a clear, sweet to sweet and sour, spicy and dry taste, in which many different flavors manifest. Medium-length finish with intense and elegant sherry. A nice portion of complex, spicy oak. A very elegant barrel influence, which ensures a very balanced finish. Simply delicious. And for the 100 € currently still a good catch. My favorite, he actually has everything. If he was strong, there would be over 90 points. Interesting nose, first no sherry, but super ripe apples and a lot of salt. And very much something that I call nose-feeling, that is, when the glass has long been gone, still stored a specific smell, or is verily occupied. Interestingly, I have mostly at Bourboncask whiskys. After a moment comes the sherry, but not dominant, but only here. Lots of salt and sea. Later loads of dark caramel. When heated, sherry dominates, still salty. Very sweet, a lot of oak, coffee, menthol, salt and caramel. Well balanced, everything plays together nicely. Still sweet, malty, with tannins and some menthol in the finish. Pretty long, becomes tartly salty to the rear, until at the end also, but tart nuttiness remains.